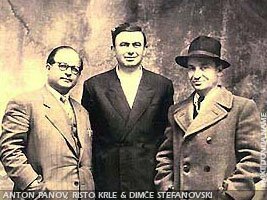 Anton Panov was born in Star Dojran in 1906, and he died in Strumica in 1967. Anton Panov attended primary school in Dojran and later, education in Strumica and Belgrade under hard material conditions. Anton Panov was interested in music and the play righting (the theater) and also narrating. "I am very happy that I am a Macedonian and that I belong to the first generation of Macedonian writers that dared, under bad conditions and even worse period, to be the first to write in Macedonian language." That's how Anton Panov started his speech, made for 40 years anniversary of his work as a writer. To the collection of his arts belong many songs, stories, dramas... First he attended as a singer in the Opera House of Belgrade, until 1936. Then he writes the first and only one songs "Vrni se vo dom", on Macedonian. There are many books dating from 1928-1938. They are "Rodendenot na Serjozha Jegorkin (1928)", then, "Ordenot Sveti Sava (1932)", "Go jadele bolvi (1929)", "Tinka (1930)" and "Beda vo kolibata (1938)". Also other famous books are "Chapa (1946)" and "Belushi (1952)". In 1951 he wrote his well known drama, under the name "Stega", which later he chages to "Veronika Samarak". There are also 2 dramas other but not that famous as the previous one, "Pilikamnik (1948)", about the lives of the Dojran fishermen and "Prerodeni (1949)". In the Macedonian literature, Panov is a famous drama writer. Anton Panov's play "Pečalbari" is written in Macedonian language in 1936, a time when the use of the Macedonian language was forbidden. The play has been played in a lot of theaters, among which the theaters in Belgrade and Skopje. The first play of this drama was in Skopje in 1936, where 37 plays were done seen by 11.305 visitors and the next 1937 year, by 7739, but played only 17 times.